I thought it would be a snap to grow vegetables in Louisiana. Just toss a few seed out the window and the next day you have beanstalks reaching into the clouds. Boy, was I wrong! I’ve always loved raising vegetables. That’s why, when I bought my first house, I got one with the biggest yard I could find. That was in Yankee Land, meaning that the yard had plenty of space for a single, containerized tomato plant. When I moved to Louisiana, I was all gung-ho about the prospects of a big vegetable garden. What with the extended growing season and ample rain, I figured that stuff would grow like gangbusters. And I was right. The plants in my garden did extremely well—all but the ones that produce vegetables. 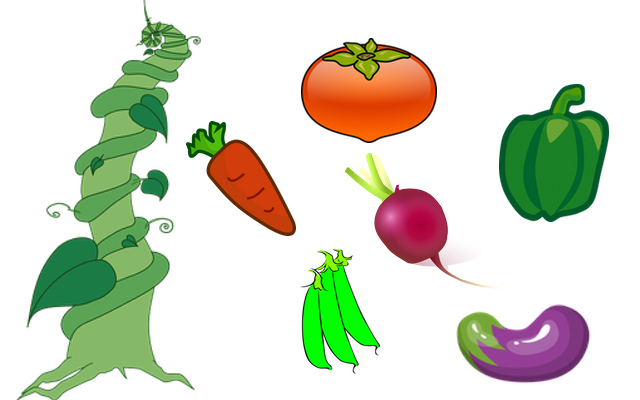 Compared to the local flora, vegetables are the 98-pound weaklings of the plant kingdom. The endemic giant hogweeds, which I swear I can hear taunting me whenever I start up the tiller, sit around just waiting for some namby-pamby radish to poke its first leaves out from the soil, and then, WHAM! They become like IRS agents on a delinquent taxpayer. “About as much as I’ve thought about growing poison ivy,” I replied. 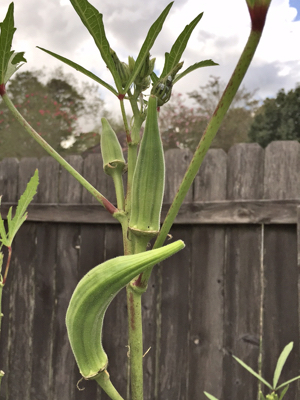 An okra plant–the only vegetable tough enough to survive amongst Louisiana’s weeds. Okra may, technically, be a vegetable in the same way that Donald Trump is, technically, a Presidential candidate. The fact is, no one in Yankee Land eats okra. Even my old roommate, Jim, didn’t eat okra, and he was such a veggie fanatic that he even enjoyed Brussels sprouts—a vegetable that I’d believed God created solely for parents to serve to their children as a form of punishment. As a Yankee, the only exposure I’d ever had to the word “okra” was as an answer to the crossword puzzle clue, “gumbo veggie.” Then I discovered that most people around here don’t even use okra in gumbo. Thus, I was faced with the unenviable choice of planting okra or giving up vegetable gardening altogether. So I tried it, all the while imagining the hogweed snorting “harrumph” as I set the seedlings into the ground. The results astounded me. In no time, I had okra plants shooting up to the sky. They were looking to reach Fi-fi-fo-fum Land without breaking a sweat. I swore I saw the hogweed cowering out in the drainage ditch. So now what do I do with all this stuff? Then came the bounty. The okra pods came so fast and furious that I had to set a lawn chair in the garden, my wife and I trading round-the-clock shifts to keep up with the harvest. Okra pods were growing faster than the Congress could spend money. The only problem was what to do with all of it. I had to figure out something fast, before our mound of okra got declared as the highest point in the state. Desperate, I searched the Internet for an emergency recipe. I found one that involved stewing the okra with tomatoes, onion, and bacon. Since three out of the four ingredients sounded okay, I tried it. It was surprisingly tasty. Added three times the amount of bacon than the recipe called for might have had something to do with it. Now I’m going to need my own pig to have enough bacon for my stewed okra. So now, we’re having stewed okra and tomatoes every night. I’m slowly working down my stockpile of okra pods, but the bad news is that I might have to sell the pickup truck to pay off my bill at the meat market. I wonder if the neighbors wouldn’t object terribly if I started a hog farm as my next agricultural endeavor.